Let the magic of immersive cinema envelope you even better! The goal is to create exactly what happens in a movie theater, with the image from a high quality projector reflecting to your eyes from a large film screen. In our blog on screen size, you will learn how to choose the right size screen for your room. Your screen size, its height off the floor, and how many rows of seats you have are factors to account for in your theater room design. The key is getting the sight lines right. You want all viewers to enjoy the entire picture without having to look over or around someone’s head, and you don’t want viewers to have to stretch their necks to see the screen. Electronic Integration experts can help with this, laying out in CAD format almost all of our dedicated front projection home theatres. Line of sight is a tricky subject and can make or break a room where more than a couple of people will enjoy the film experience. In designing a dedicated home theater room, you should not have to worry about anything other than making things perfect for sight and sound. (That’s why you made it a dedicated room!) We can help you with screen layout, plus projector, speaker and component placement. Other important considerations are how it will look and how the room can be treated for acoustics. Many magazines and web sites can give you ideas for the architectural look of your theater. Electronic Integration also has decorators and designers we work with on theater appointments. We cannot stress enough how big a difference the proper acoustics approach will make in the enjoyment of your theater. Please read our acoustics blog for more information. In designing a dedicated home theater, speaker placement is extremely important. By far, the most important track in a film is the dialogue track. This is produced through the center channel speaker. If you cannot understand dialogue, the impact of the movie is greatly reduced. In theater rooms with multiple rows of seats, hearing dialogue clearly can be a challenge. Not only should your family and guests be able to see the entire screen, they need to hear all of the sound. No speaker is more important than the center channel. It’s fairly easy to get sound right when there is only one row of home theater seating, but with two or more rows, the location of the center channel becomes critical. Our experts will help you with your design to optimize the center speaker position. The subwoofer (the speaker providing deep bass effects) can usually be hidden under the screen. Again, we can help with design options. Remember that the worst spot for a subwoofer is in the middle of your room, the best, close to a corner. And the more subs the better – four is ideal! 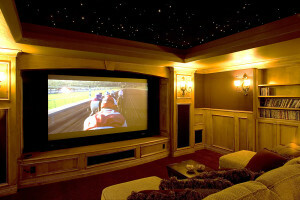 In most dedicated home theater rooms, equipment is housed outside the room to minimize noise. It is critical for the life expectancy of components that they have adequate ventilation. Your amplifier or receiver will put out some heat, but the cable box, satellite box, or video game radiate a great deal of heat. If you use an existing cabinet, passive ventilation by drilling holes is not sufficient to exhaust hot air. Electronic Integration typically installs a ventilation fan in the cabinet to exhaust the hot air, and using a remote mounted thermostat controlled fan is even better. We can mount one of these in your crawl space so you never hear the fan noise. If no one can figure out how to turn the system on and make selections, it’s obvious the enjoyment factor will drop! A well thought out remote control can make all of the difference! Reliable options now exist so you can hide all your components and get signals to them perfectly. We offer you a wide range of options. Imagine an area of your home decorated with a cinema theme, perhaps with a vintage popcorn machine and concession area setting off the area outside the screening room. Your invited guests gather here for wine and conversation before the movie begins. At the scheduled time for your film, your lighting control system automatically dims your lights as programmed, signaling when you and your guests should move to your theater to enjoy this week’s latest Blu-ray movie release. When everyone is seated, a single touch to your personalized touch screen controller dims the lights to viewing level, activates your projector and starts the movie. During the film, images have almost three-dimensional vividness, and you are enveloped in the music and effects of the soundtrack, clearly understanding everything that is said. When the movie ends, your friends comment that the experience is so much better than a movie theater, they can’t imagine why you would ever leave home! Is this your ultimate home theater dream? Whatever yours happens to be, our design team can help your dream come true.